NEStron is an NES emulator capable of playing virtually all games created for the then-popular Nintendo Entertainment System. 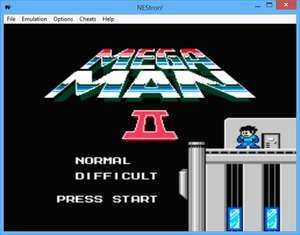 It is compatible with all versions of Windows and as you can see, it does a great job of playing our very favourite NES title, Megaman 2. Setting NEStron up doesn't require much know-how and as it is an older program, the menus contain far less jibber-jabber than what you might be used to with today's software. Easy to use, easy to play and very capable of bring back your old memory of the days of the Nintendo Entertainment System! Version 0.6.6b is a freeware program which does not have restrictions and it's free so it doesn't cost anything. For security reasons, you should also check out the NEStron download at LO4D.com which includes virus and malware tests. Additional screenshots of this application download may be available, too.